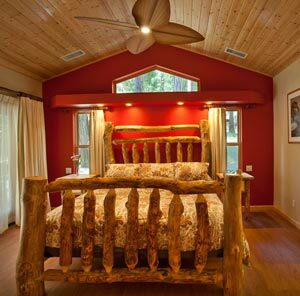 Our recently remodeled Yosemite cabin is available for year round rental. 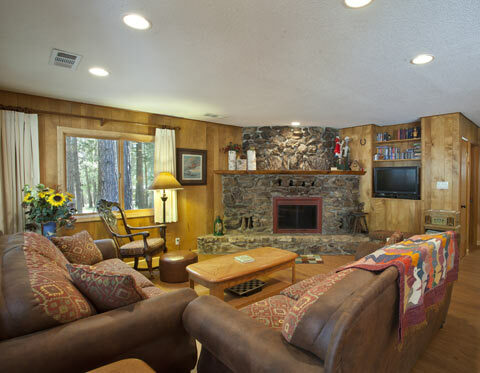 Featuring 3 bedrooms and 3 bathrooms, our cabin is decorated in an updated mountain style and will be the perfect family retreat after a wonderous day in Yosemite National Park. Enjoy all the Wawona attractions including golf, hiking, horseback riding, swimming, fishing or just relax at the cabin cooking a great family meal or relaxing in the outdoor jacuzzi. Our family takes pride in offerring our cabin to visitors from all over the world. 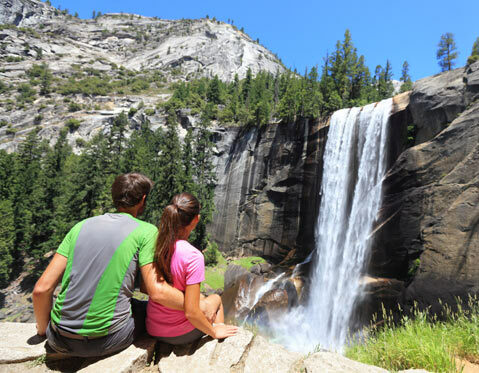 To first time Yosemite visitors or regular guests, from our family to yours, "Welcome!". 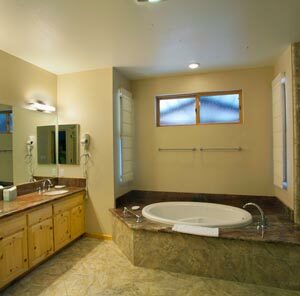 Remodeled in 2013, our privately owned vacation home inside Yosemite National Park is available for rental year round. 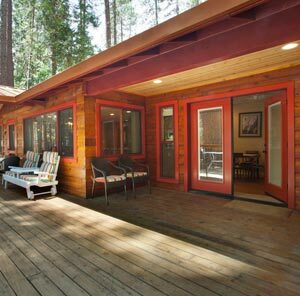 Located in Wawona, our cabin affectionately called "The Buss Stop", is fully furnished and professionally maintained by onsite cleaning and maintenance staff, the cabin is perfect for local or international visitors looking for a relaxing retreat inside Yosemite National Park. Remodeled in 2013, the "Buss Stop" offers a unique modern-mountain style that provides our guests with all the comforts of home in a peaceful and classic mountain setting. Click the arrows above to continue the photo slide show. 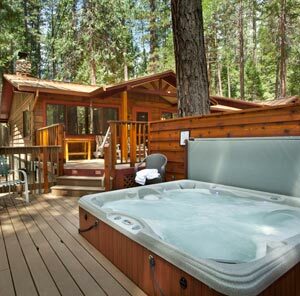 Relax in the private outdoor jacuzzi while looking up at the towering Sugarpine and Redwood trees as they become silhouetted against the sunset colored sky. Our cabin offers modern comforts including indoor and outdoor jacuzzi tubs, flat screen televisions, fully equipped kitchen, two stone fireplaces, WI-FI, long distance phone calls, central HVAC, tankless water-heater, rainfall shower, and electrical backup generator. A spacious deck greets guests complete with gas barbeque grill, patio dining set and lounge chairs. A private covered connected to teh master bedroom is a great place for morning coffee and breakfast. 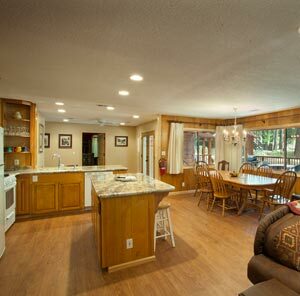 The open floor plan layout of the cabin allows all guests to spend time together. A fully equipped kitchen and large dining room is perfect for family meals and holiday feasts. The newly added master suite includes custom marble and ceramic tile jacuzzi tub, glass rainfall style shower, and double vanity sinks. The newly added master bedroom suite includes knotty-pine ceilings, custom king-bed, gas stone fireplace, flat screen television with satellite receiver, dimmable reading lights, walk in closet, vaulted ceiling with fan, and private patio. The large front yard of the cabin offers privacy as well as plenty of space for children to play and explore. Take a family photo on our redwood bridge and keep a lookout for deer who frequently wander through. The fully furnished kitchen and great room ensure all members of the family can enjoy doing what they love while spending time together. The kitchen includes propane stove and range, microwave, refrigerator, full size dishwasher and is fully stocked with cookware, plates, cutlery and everything you need for food preparation and serving at the large 8 seat dining table. The living room includes original river-rock fireplace, satelite flat screen television, DVD player, CD, record player, and AM-FM radio. WI-FI Internet and free long distance phone services is also included. 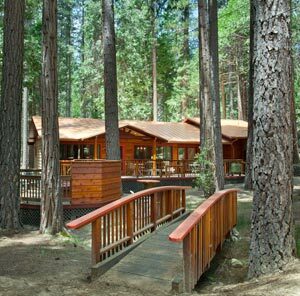 Enjoy the crisp, pure, Yosemite National Park air and towering Sugarpine and Redwood trees on the spacious deck. Comfortable patio lounge chairs, outdoor dining tables, gas barbeque grill, and a jacuzzi spa are great ways to enjoy the Wawona evenings. 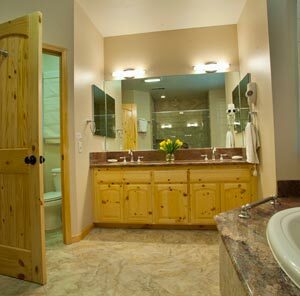 The cabin features three private bedrooms and three bathrooms, with all linens and towels provided. 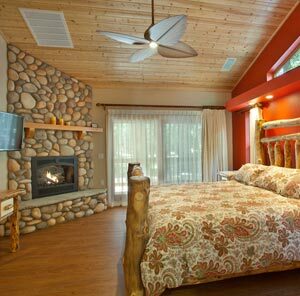 The master suite, built in 2013, includes custom pine king-sized bed, gas fireplace, walk-in closet, flat screen television, private patio, jacuzzi tub, and rainfall shower. The second bedroom has a king bed and ajoining bathroom. The third bedroom contains a queen bed and a full bed, with adjoining bathroom. 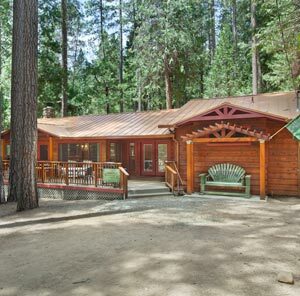 Staying in Wawona is a great way to experience Yosemite National Park, but the "Buss Stop" vacation home offers additional features to make your trip a convenient one. The cabin includes backup electrical generator, tankless instant water heater, covered firewood stock, an international collection of books, and a large land parcel with plenty of space for children to explore while staying near the cabin. Our cabin is managed and booked easily via Scenic Wonders vacation homes. Choosing to stay in Wawona versus directly in Yosemite Valley has many advantages. Yosemite National Park is the United States second most popular national park, with close to 4 Million yearly visitors. Wawona, located inside the Yosemite National Park, offers many of the same attractions and activities as the valley, without the crowds. Depending on the season, Wawona offers golf, horseback riding, hiking, history tours, swimming, dining, bicycling, fishing, guided bus tours and holiday festivals and events. Our family recommends the short hike to "the swinging bridge" for a refreshing swim during the summer. A trip to Yosemite isn't complete without a visit to witness the Giant Sequoias of Mariposa Grove located just a few miles from Wawona. Take a guided horseback trip from the Wawona stables up the Chilnualna Falls trail, an 8.4 mile (13.5 km) round trip hike to a trio of waterfalls. Be sure to visit the lobby of the Historic Wawona Hotel for live piano music and cocktails. In the winter, take a ski or snowboard lesson at Badger Pass, a wonderful family oriented ski area. Groceries, paper towels, shampoo, comfortable shoes for day hiking/valley walking, sunscreen, swimsuits, camera, bug repellent, flashlight, tire chains (see below). Badger Pass ski area, just 19 miles from the cabin offers a full ski lodge, lessons, and rentals. Check conditions and operation calendar at www.badgerpass.com. Be sure to fill up your gas tank before entering the park (if coming from the south on Hwy 41, stop in Oakhurst). There is a 24 hour (with credit card) gas station just a mile from the cabin, but price is higher than in town. If you forget any miscellaneous grocery items, the Pine Tree market is just a few hundred feet from the cabin. If entering the park from on Highway 41 (via Fresno), you can stop in Oakhurst at the Vons or Raley's supermarkets for your shopping needs. If you are visiting Yosemite in the snow season, you must carry snow chains for all vehicles, even All Wheel/Four Wheel drive. Often there is a snow chain checkpoint on the inbound roads where law enforcement will verify you have snow chains. Chains or snow cables are acceptable. They can be purchased at auto-parts stores and we recommend you purchase them in your home town, instead of paying a premium price at stores near Yosemite. Be sure to pack chains so they are easily accessible and keep a pair of old hand gloves with you and a few large plastic trashbags as well, which you can kneel on in the slush and snow when installing your chains. Install your chains in a safe area, well away from traffic, and drive safely. Our cabin is managed by Scenic Wonders, which offers year round vacation cabin rentals. You may reserve the cabin year-round by contacting the Scenic Wonders via phone toll free at 1-888-YOSEMITE (967-3648) and requesting the "Buss Stop" cabin or you can reserve the cabin by visiting Buss Stop Cabin with Scenic Wonders . Pricing depends on the season, with the peak season being summer. To contact the owners with questions, please fill out the form below or call us at the number below. Reserve our cabin by contacting the management office at Scenic Wonders and ask for "The Buss Stop".